Born in Austria, 1916, Gaby Schreiber studied theatre and interior design in Berlin, Florence and Paris. Schreiber then took up interior decoration and worked in a professional studio for two years. In 1935, she opened her own studio as decorator and designer, and gained a reputation for her designs for pottery, glass, light fittings and everyday household objects. She was married to Leopold Schreiber and the couple left Germany in the late 1930s to move to the UK. Here, she was approached by the British plastics manufacturer Runcolite Limited, where she became the company’s exclusive plastics designer, producing the first examples of moulded plastic cabinet furniture. In 1943, she set up Gaby Schreiber & Associates, based in London. 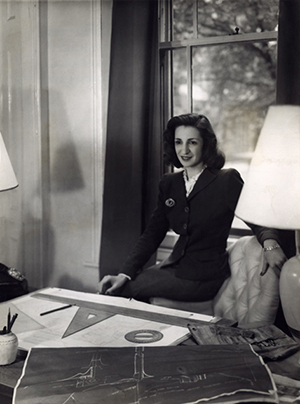 From the 1950s onward, Schreiber and her team tackled large design projects all over the world, and were responsible for the interiors of aircraft (the BOAC fleet, 1957-63), ocean liners, (Cuncarder and QE2), department stores, office blocks, hospitals, factories, cinemas, cabin cruisers, restaurants, and conference halls, plus domestic interiors and conversions. Schreiber herself sat on many design juries and committees, both national and international, and her work has appeared in international books and journals on design (McQuiston, p.110). In the 1960s, she also headed two companies: Convel Ltd and Convel Design International. She was a Fellow of the Society of Industrial Artists and Designers and a council member of ICSID. She was also actively involved on the councils and judging panels of the Design Centre Awards and the Duke of Edinburgh’s Prize for Elegant Design, 1960 and 1961. Gaby Schreiber died in 1991. Liz McQuiston, Women in Design, A Contemporary View, 1988, pp.110-113. Gaby Schreiber’s archive is held in the V&A Archive of Art and Design.